Today’s plan was rather an ambitious one, covering Madaba, Mt. Nebo and Bethany-Beyond-Jordan, all of which an hour’s distance away from each other. The public transport only operates between Amman and Madaba, so I was expecting to spend a hefty amount of my budget on taxis. The first stop was Madaba, famous for it’s Byzantine mosaics. It felt a bit too small to be called a city, but still had the energy and vibrancy that I much preferred than the hectic Amman. The town of Madaba was once a Moabite border city, mentioned in the Bible in Numbers 21:30 and Joshua 13:9. It also has the largest Christian community in Jordan, and I could see many women walking on the streets without wearing a headscarf. I decided to follow the walking tour of the town suggested in my Lonely Planet travel book which should last about 3 hours, which would give me plenty of time to visit other biblical sites near Madaba. After making a brief stop to watch a sand bottle being made, I started walking along what is known as the Tourist Street, filled with souvenir shops for tourists. Every single shop I pass by, the shop keepers tried to lure me into their shops, all of which I politely refused and walked on…until I reached a spacious shop called ‘Peace’ which seemed to deal with more high-end products. A man came out and greeted me with a big friendly smile, and to my surprise, a couple of young men nearby greeted me in Korean! He invited me for Bedouin tea and I could not refuse it. His name was Menwer, and he used to work at the airport in catering. The shop he was working now was owned by his nephew. 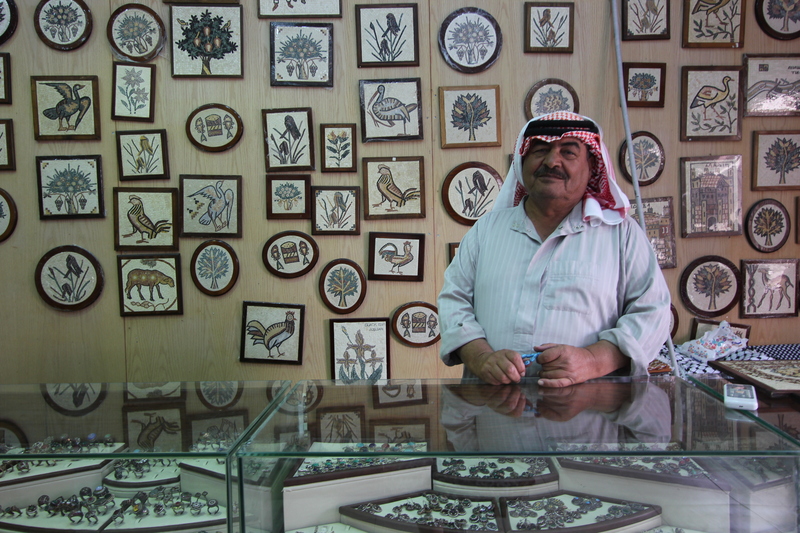 It must have been a low-season for Madaba at this time of the year, as there were hardly any tourists in the town, which meant I could ask him as many questions about Jordan as I liked without having to worry about me disrupting his business. Conversing with someone from different culture and language can be an amusing experience, with interesting metaphors and unusual figures of speech. “Are you married?”, he asks me. I ask him around what age Jordanian girls get married, and he answers that it’s around 20 to 23. “It seems so young!” I say. “Women are like apples. When they are young, when ripe, they are nice and delicious. When the time goes, not so good. You have to have them when they are good”, and he makes a ‘yuck’ face. I scream at him jokingly and we both laugh, and do a high five. Spending time with Menwer set me back against my schedule, so I hurried through my walking tour. All key sites were very small and not very time consuming, but I got lost a few times with my pretty much non-existent navigating skills. 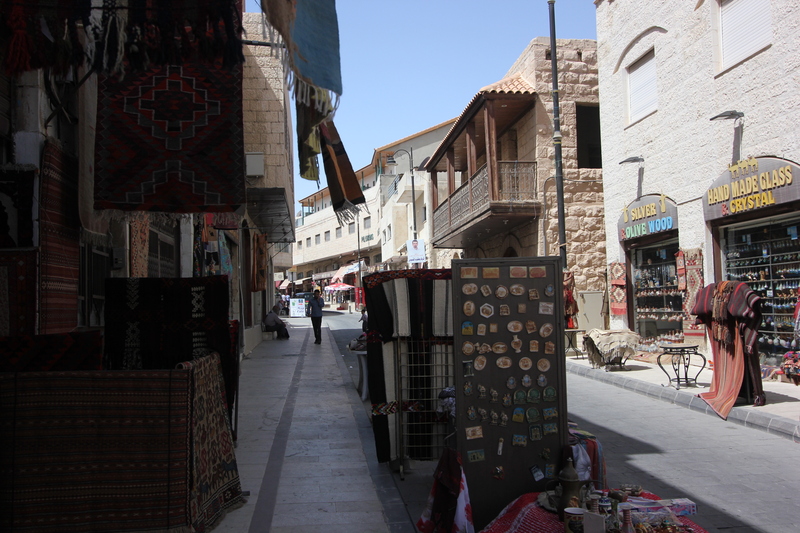 There were many taxis on the main street of Madaba but I decided to go back to Menwer to arrange a taxi for me. I felt I could get a more trustworthy taxi fare if it was through him. Next stop, Mt. Nebo. Nice post. I loved Madaba! Thank you Jen! It’s one of my favourite cities in Jordan as well!